Have you heard of CMV? Join the stop CMV campaign. Baby left disabled from a virus most of us will probably get. When Kate Daly was pregnant with twins she worried about the normal things mums worry about. How to cope with two new babies, the lack of sleep, juggling life with four kids under the ages of four-and-a-half. Her pregnancy was normal, she was fit and healthy. So she never expected this. Her twins born November 2011 both affected by a common virus. Kate and her family. Image supplied. A virus so common in fact that half the population have been infected by adulthood and more than three quarters of people by the age of 40. A virus that Kate herself contracted while she was pregnant and passed it unknowingly to her twins. A virus that left her baby boy William with multiple disabilities including cerebral palsy and severe dyspraxia - and Kate didn’t even realise he had it until he failed an infant hearing test at three weeks old. A virus that most of us have hardly ever heard of, have got a high chance of getting and is preventable. Kate Daly and her son William. Image supplied. Have you heard of Cytomegalovirus or CMV? It is estimated that one to two babies a day are born with permanent disabilities of a varying degree from CMV and at least 5 % of stillbirths are caused by the virus. And yet the majority of pregnant women haven’t even heard of it. For Kate Daly, a mother of four from Sydney, the diagnosis that her babies had been infected by CMV was devastating. “The last few years have been the hardest years of my life,” Kate told Mamamia. William has come a long way but Kate says he is like a 2-year-old in a 5-year-old&apos;s body. See him in this home video. Post continues below. She says she think she was infected with CMV around the end of her pregnancy but she never really had any symptoms except a mild sore throat and a slight fever. Until her son William - now aged 5- was diagnosed she, like most pregnant women had never heard of it. William as a baby.Image supplied. Professor William Rawlinson, NSW Health Pathology and Senior Medical Virologist tells Mamamia that CMV is more common that Down Syndrome, more common than HIV, more common than fetal alcohol syndrome, more common than rubella and toxoplasmosis and yet virtually unheard of. “350 babies are born with CMV each year, fewer babies are born with Down Syndrome” he says. In fact CMV is the most common infection which causes deafness in childhood. Professor William Rawlinson, NSW Health Pathology and Senior Medical Virologist. Image Supplied. of the Congenital CMV Association of Australia is working along with Professor Rawlinson to raise awareness of CMV. Kate says that women planning a pregnancy need to be aware of it and that most just aren’t. Now this one threw me so I clarified it with Professor Rawlinson. Should pregnant women really not be kissing babies? That’s so hard I asked him. He assured me that women should not stop kissing their children, but that they just needed to be aware of the infection. “They need to be aware of it” and he tells me, just not kiss them on the mouth so you could exchange saliva. Kate Daly and her family.Image supplied. Prof Rawlinson wants to ensure that women are not frightened by information about CMV but instead empowered by it. Help share awareness of CMV by uploading your #StopCMV selfie to social media this June. Image Supplied. CMV spreads via bodily fluids, particularly via the saliva, urine and stool of young children which may contain CMV for months after they were infected with the virus. Once infected women may not even know they have it. While experts are currently working on a vaccine and on the use of antiviral drugs in newborns diagnosed with CMV right now the best method of avoiding CMV is through increased hygiene. Like Kate Professor Rawlinson comes across children and families affected by CMV daily. Families devastated by a virus that could have been prevented. Cytomegalovirus, commonly referred to as CMV, is a member of the herpesvirus family. It is common and typically harmless to the general population. More than three quarters of people have had it by the age of 40. 1 out of 3 pregnant women who become infected with CMV will pass the virus to their unborn child. One to two babies is permanently disabled by congenital CMV every hour. You can take preventative measures. Women can be tested for CMV prior to pregnancy – ask your doctor. Do not share food, utensils, drinks or straws. Do not put a dummy in your mouth. Try not to kiss a child under six years of age on the lips or cheek to avoid contact with saliva. Wash your hands after wiping a young child’s nose, changing nappies, feeding a young child or handling children’s toys. Help share awareness of CMV by uploading your #StopCMV selfie to social media this June. For more information: Congenital CMV Association of Australia. 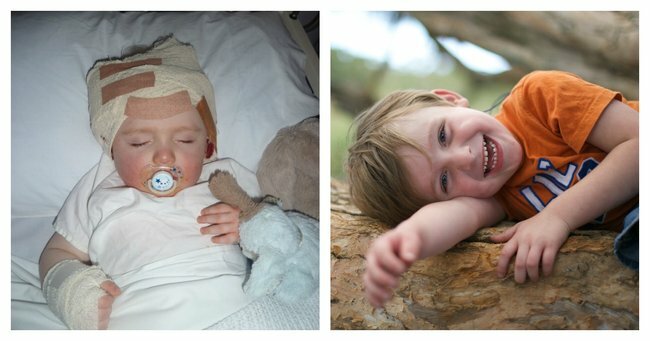 Feature Image: William as a baby and him now aged 5. Images supplied.